Any day care facility with an enrollment of 13 or more is considered a Day Care Center. This tip sheet is meant to address day care centers, as defined by the Tacoma Municipal Code (hereinafter TMC). The location, design, and operation of day care centers in the City of Tacoma must comply with the following standards in addition to any other requirements of law. In residential zoning districts, day care centers with an enrollment of 50 or less are subject to the same lot size and setback standards as single-family homes. * Most single-family homes are located in either the “R-1” or “R-2” District. 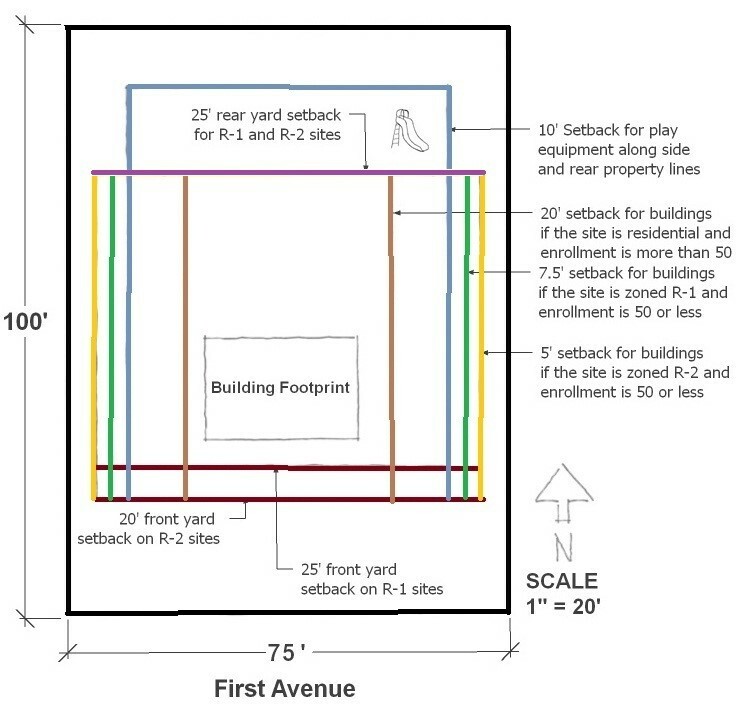 For day care centers with an enrollment of more than 50, side yard setbacks of at least 20 feet are required in all residential zoning districts, except that on corner lots the side yard facing the street shall provide the same setback as required for a single-family dwelling. No structured area for active play may be located in a front yard. Play structures must maintain a minimum 10-foot setback from any side or rear property line. *See Tip Sheet L-145 for standards that apply to lots that are smaller than the required lot area or lot width dimensions. The number and size of signs allowed on each day care center property is determined by the zoning district that the day care center is located in. Speak with a Land Use Planner to as determine the applicable zoning district and sign sizes allowed. Parking spaces are required at a ratio of 2 spaces per 10 enrolled children. In R-1, R-2, R-2SRD, HMR-SRD, and R-3 Districts, the establishment of a day care center requires the approval of a Conditional Use Permit (CUP). In R-4-L Districts, day care centers with an enrollment of 50 or more requires approval of a CUP (see Tip Sheet L-640). Please refer to the development standards for daycare centers in TMC 13.06.155 as well as the general CUP criteria in TMC 13.06.640. All application materials must be submitted in electronic PDF format on compact disc (CD) or online at TacomaPermits.org. See Tip Sheet G-230. No structured area for active play shall be located in a front yard. 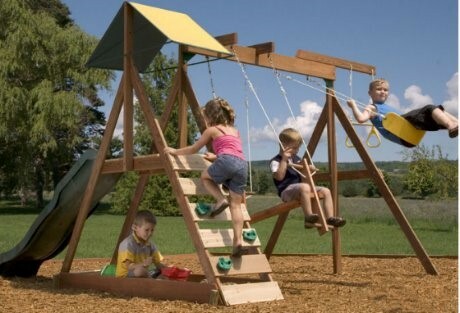 Play structures shall maintain a minimum 10-foot setback from any side or rear property line. Determine the zoning district that the site is located in. If needed, the project can be discussed with a Land Use Planner by phone at (253) 591-5577 or in-person at Building and Land Use Services on the 3rd floor of the Tacoma Municipal Building, 747 Market Street. The day care center is proposed in a zone that requires a Conditional Use Permit:The CUP process takes approximately 120 days to complete, from the date a complete application is submitted, and requires scoping and pre-application meetings. Meeting requests may be made online at https://aca.accela.com/tacoma/Default.aspx (see Pre-application Request tip sheet G-310). Also see: Tip Sheet L-640, Conditional Use Permit. Additional parking may be required. Off-street parking spaces are required at a ratio of 2 spaces per 10 enrolled children. Also see: Tip Sheet L-510, Variance to Parking Standards. The site has hardships that do not allow the outdoor play areas in the rear or side yard. Submit plans for review. If preferred, preliminary plans may be discussed with staff prior to submitting a permit application on the 3rd floor of the Tacoma Municipal Building, 747 Market Street. An earthquake upgrade may be required. A fire separation is required between floors and other adjacent spaces unless the building is equipped with an automatic fire sprinkler system. The building is required to have at least 1 accessible entrance/exit. Heating Ventilation Air Conditioning (HVAC) must be brought up to code. The amount of toilet and lavatory fixtures must be brought up to code. After the plan review is completed, the applicant is notified to pick-up the plans and building permit at the Tacoma Municipal Building, 747 Market Street, and pay the applicable fee for a Minimum Code Inspection or a Building Permit. Applicable fees are based on the amount of work proposed. For an estimated fee quote, call (253) 591-5030. A Minimum Code Inspection is done when no physical changes are required to the building. If physical changes are required, then a building permit will be issued. The Minimum Code Inspection fee allows for City staff to inspect the building in order to verify that it matches the approved plans. If the Minimum Code Inspection is passed, then a Certificate of Occupancy will be issued. If a Building Permit is issued, a Building Inspector will inspect the work being done. Once all inspections are passed, a Certificate of Occupancy will be issued.